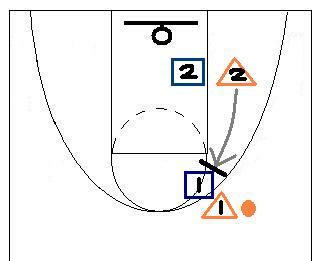 The pick and roll is a simple yet effective play where one player sets a screen for a teammate with the ball then rolls to the basket to receive a pass. Despite its simple nature, you’ll see it being run by coaches, teams, and players from the playgrounds to the pro level. The purpose of the pick and role is to get someone open to create easy scoring opportunities closer to the basket instead of settling for contested jump shots. When executed properly, it creates disorder and chaos in the defense; the player with the ball will either have an opening to drive or shoot, or the defenders will have to switch off. Player 1 on offense begins with the ball and is being guarded by Player 1 on defense while Player 2 is being guarded by Player 2 on the low post. Player 2 comes out and sets a screen for his teammate. The screen is square and seals off the defender, but cannot be moving. 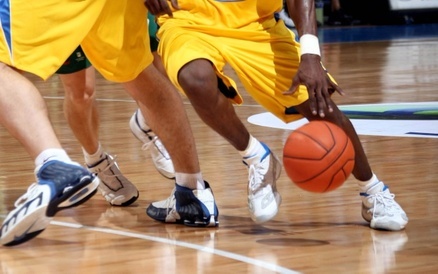 Player 1 accepts the screen and dribbles off the screen to the right. Player 2 will likely come out and follow his defensive assignment. As soon as Player 1 uses the screen, Player 2 spins counterclockwise pivoting off his right foot, seals off Player 1, and rolls towards the basket, putting his hand up as a target to receive the pass. Player 1 sees that Player 2 is open and makes the pass. *It’s really important for Player 1 to come off the screen brushing against the screener so that the defender is sealed out. 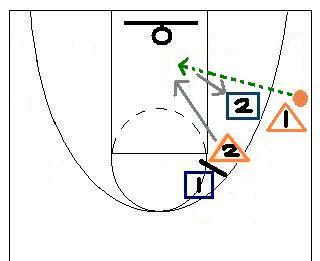 The screener should also hold the screen long enough for his teammate to get by. 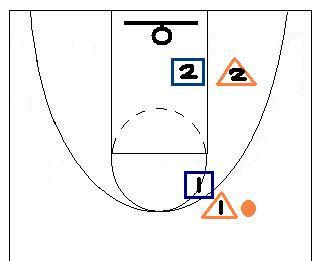 The defenders will not always switch; a good strong defender may go over or under the screen. If he goes under, you may have an opening still to take a jump shot. If he goes over, then you won't have much to work with. 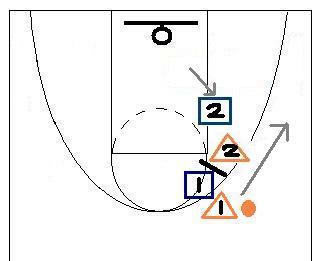 Just keep practicing the pick and roll again and again, focusing on the fundamentals.